Motorists and cyclists drive in along the same road in the morning. It creates insecurity for the school’s cyclists, when they are going to school and in addition must cross the roadway to get to the bicycle racks. For many years, the school has therefore wanted a two-way bicycle path into the school. The cycle path should be established in a green area next to the school. With the help of the school patrol, engineers and the school board got new eyes on the problem. The students suggested that a two-way cycle path was to be established on the road to the school, so that the students was not to cross the roadway to get to the bicycle sheds. 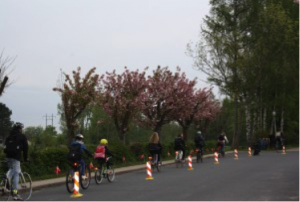 The idea of ​​a cycle path on the road to the school was tested for a period of six weeks when a temporary barrier was established on the roadway to separate bicycles and cars. Agedrup School’s temporary bike path. The cycle path was to test whether the pathway into the school became more comfortable for the school’s cyclists, now that the cars could no longer park along the road and the cyclists should not cross the roadway to get to the bicycle racks. After a trial period of six weeks, traffic counts showed that 56% more students cycled to school. Based on this, the City of Odense, decided to make the cycle path permanent. Agedrup School’s permanent cycle path!